Designed for cable drive remote steppermotors with a gear unit. An input voltage between 0..5 V with a resolution of 10 bits (1024 voltage steps, 4.88 mV per voltage step) controls the position of the steppermotor. Number of steps of the motor can be adjusted to up to 65,535 steps, so any gear unit and number of rotations of the motor can be selected by software. Simple driver for driving the motor. Very fast rotation of the motor can be achieved by optimizing the drive frequency. Reduction of current requirements by switching the coils of the motor off after a preselectable activation time following the last step. The processor ATtiny13 provides the following functions. The operating voltage of 5 V is supplied to the pins 8 (+5 V) and 4 (0 V) and blocked with a ceramic capacitor of 100 nF. Pin 1 (= RESET input) is tied with a resistor of 10 kOhm to the operating voltage. Input PB4 (Pin 3) measures the analogue voltage, using the internal AD converter, by comparision with the operating voltage. 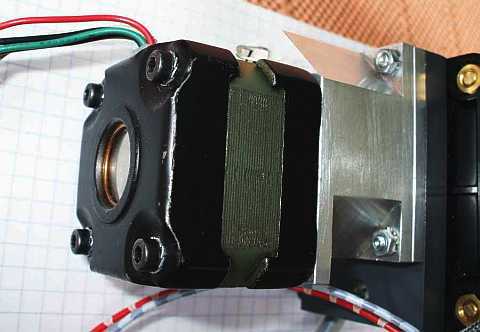 From its conversion results, software calculates the target value of the steppermotor's steps. The output port pins PB0 to PB3 (pins 5, 6, 7 and 2) control the driver for the coils of the steppermotor. The ISP interface serves as programming interface to program the AVR in the system. The pinout is ATMEL standard. The ISP interface uses the port bits PB2 (SCK, Pin 7), PB1 (MISO, Pin 6), PB0 (MOSI, Pin 5) and the RESET at Pin 1. 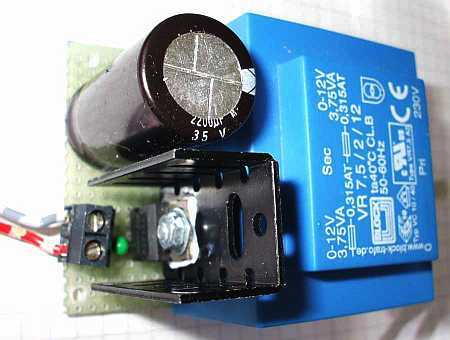 The operating voltage at VTG, if connected, provides supply current to the programmer. Leave VTG open if the programmer provides its own supply. GND is reference for the negative operating voltage. The drive current for the coils of the steppermotor is controlled by the driver IC ULN2003A. The outputs with open-collector-driver transistors allow for voltages of up to 50 V and currents of up to 500 mA. They switch the different coils of the motor on aned off. Induced inductive backdropping voltages, when coils are switched off, are shortcircuited by diodes, that are connected internally from each collector to the pin CD. 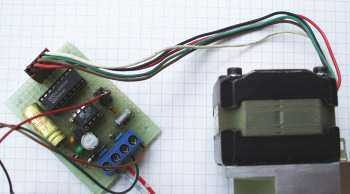 The motor used here is operated with a 12 V supply voltage and requires a current of approx. 150 mA per active coil (because there are alway two coils active at a time, together 300 mA). The input pins I7..I4 of the driver are controlled by the processor (active high, logic 1 switches coil on). The supply voltages are filtered to avoid glitches by the switching coils. Supply of the coils is connected over a diode 1N4007 and smoothed by a capacitor of 100 µF. The processor is supplied by a voltage stabilizer 78L05. 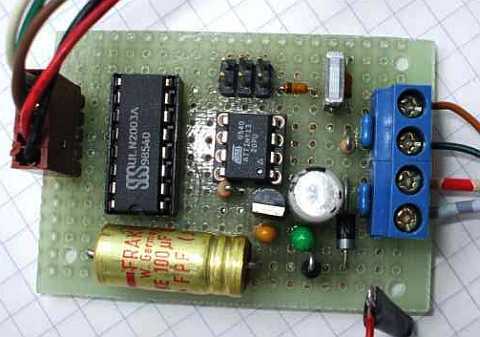 Its input is connected to the 12 V supply over a diode 1N4007 and and capacitor of 100 µF. The stabilizer is blocked with tantalum capacitors of 1 µF resp. 2,2 µF to avoid oscillations. The supply and regulation of the controller/driver comes over a four-wire connection cable from a 12 V power supply (click on the picture to download a PDF doc with higher resolution). The 12 V supply is mounted on a small board. The software for the ATtiny13 is written in assembler, the source code is here for download. the step control and output to the steppermotor. The vector table redirects program execution to the main program, if a reset starts the processor. In case of an interrupt, the service routines for the timer/counter and the AD converter are re-directing. Available vectors that are not used here are represented by RETI instructions. the deactivation counter is set to its initial value. clock divider =128, at 1.2 Mcs/s internal clock and 13 clock cycles per conversion each conversion requires 1.387 ms, summing up of 64 conversion results yields a complete measuring cycle each 88.75 ms or 11.3 measuring cycles per second. no automatic restart on conversion complete (restart is performed in the interrupt service routine). the clock prescaler is set to 1024 and the timer is started, the counter clock is therefore 1.2 Mcs/s / 1024 = 1.172 kcs/s, with CTC values between 1 and 255 yield frequencies between 1172 and 4.6 cs/s for the steps of the motor. the processor is set to sleep mode idle, that means: between the interrupts of the counter and the AD converter program execution is stopped. The AD converter converts the input voltage on pin 3 (PB4, ADC2) to a value between 0..1023 and triggers a Conversion Complete Interrupt. The Interrupt Service Routine, starting at the label "AdcInt:" reads the result from the ports ADCL und ADCH and sums it to the register pair rAdcH:rAdcL. The counter rAdc is decreased by one. If rAdc reaches zero, the sum value is copied to the register pair rAdcRH:rAdcRL, the sum is cleareed, the counter is again set its initial value 64 and the flag bAdc in the flag register is set to one. Finally, the next conversion is started. Summing up 64 conversion results results in an averaging over these values, removing random results and fluctuations in the input signal, and slows down the measuring process to a convenient cycle duration. The resulting sum value is between zero and 65,535 (0x0000..0xFFFF), an excellent basis for the following calculation of the target value. writes this result to the target value register pair rSmSH:rSmSL (during which interrupts are disabled to avoid errors in the motor adjustment, should there be a timer interrupt between copying LSB and MSB). The step control and output to the steppermotor is done in the interrupt service routine of the counter, starting with the label "Tc0IntCA:". First, the actual and the target value registers are compared. If they are equal, a jump to the label "Tc0IntCA0:" is executed. There, the delay counter in the register pair X is decreased by one. If the delay counter reaches zero, the coils are de-energized by writing zeroes to the driving port bits, the delay counter is restarted and the service routine is left. this is written to the output port, which switches the correct coils of the motor on/off. Step 4: 0x09, binary 1 0 0 1. Note: If the coils Q1..Q4 of the stepper are connected in a different manner to the driver outputs, it is necessary and sufficient to change these two words (see below). In the service routine finally the delay counter is restarted, to keep the coils activated for the appropriate preselected time, after changing the output pattern. The three debug switches debug_calc, debug_const and debug_out must be set to zero! The constant cSmSteps should be adjusted to the number of steps that the motor should perform over the whole range (maximum: 65,535). The constant cSmFreq must be adjusted to the frequency that the motor is reliably moving (minimum 5 cs/s - for extremely large motors, maximum 1171 cs/s - far too fast for most types of motors). the constant cSmDelay sets the number of cycles, for which the coils stay activated, after having changed the drive pattern of the motor. If cSmDelay is equal to cSmFreq, the delay is exactly one second. The order of the four coils on connector J2 might be different with different types of motors. If a different order is to be adapted, it is sufficient to change the table SmTab:. The source code is available in .asm text format here, in .html format here.